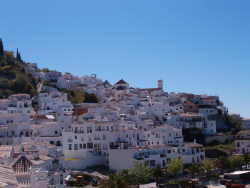 Frigiliana - all that you imagine a Spanish 'white village' to be! Frigiliana is one of the Axarquia region's most picturesque white villages and is located just 6 kms inland, above the busy coastal town of Nerja, bordering the Sierras de Tejeda and Almijara Nature Park. Frigiliana's roots can be traced back to prehistoric times, however it is the remains of the Moorish occupation of the village that is most evident today. The most important of these remains are those of the hill top fort EL Fuerte, where in 1569 the final bloody scenes were played out of the Battle of the Rock of Frigiliana, during which the Catholic kings defeated the last of the Moors. Today the location of the remains makes for a panoramic viewpoint. The village is below the fort and divided in to two parts old & new, although it is the older quarter with it's "chocolate box" appearance of winding narrow cobbled streets of white washed house with wrought iron balconies and brightly coloured pots of geraniums, that has lead in previous years lead to Frigiliana receiving the accolade of "prettiest village in Andalucia." In addition the famous locally produced sweet wine and the chance to purchase traditional handmade ceramics and rafia objects which can be seen being made, has ensured that the village is now a popular place to visit for many of the tourists staying in the region. The village is also becoming a popular place to own a second home as is born out by the threefold increase in its population during the busy summer months. Despite this the village has not been spoilt by its growing popularity and still retains much of its traditional charm. 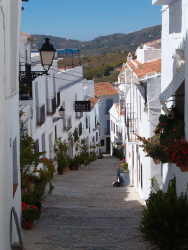 Frigiliana is best explored on foot, although it is worth mentioning that many of the streets invovle climbing steps. The best time to visit the village is out of season when the laid back pace of life can be best appreciated. As a tip during the summer try visiting on a Tuesday when the popular weekly market is in nearby Nerja, making for a quieter day in Frigiliana. If you arrive by car follow the signs for the old town and you can park either in the open air car park below the village or in the parking bay which runs along the along the main road. From here walk up and bear left past the old sugar mill, in front of which you will find the tourist information booth. As you wind your way up through the cobbled streets you will see numerous ceramic tile plaques telling the tale of the last rebellion of the Moors as they made their final stand against the Catholic Monarchs. We suggest that you follow the signs up to the 'mirador' where there is an open air café with spectacular views. After a refreshment or two make your way down via one of the most photographed streets in village c/ Zacatin. Half way down this street of steps is a restaurant of the same name which is good for either lunch or dinner. To the right at the end of c/Zacatin is the village's main church Iglesia San Antonio de Padua which dates from the 17th century and is located on the square of the same name, where there are a couple more cafés. Leave the square the way you came and follow c/Real as it winds its way back down to the car park. The first fiesta in the Frigiliana calendar is that in honnour of the villages Patron Saint San Sebastian and takes place in January. It is a good thing that the winters in Frigiliana are some of the region's mildest, for the tradtion is for Villagers to carry a statue of San Sebastian bare foot through the streets. Other fiestas celebrated include February Carnival , Semana Santa and in May Cruces de Mayo. There is also a fiesta in honnour San Antonio de Padua which takes place in June and Frigiliana's Feria is held in August.